Not of his own shadow, but of the three men from ConAgra who’d dropped a duffel bag of green outside his den the week before. “Six years of long winters, Phil,” he’d said. The man with no neck, and no ankles. “We’ve had enough. It’s no good for the growing season.” He deposited the bag, then jerked a thumb at the men behind him. One had a shovel. The other wiggled a hose that trailed back to their Cadillac’s tailpipe. 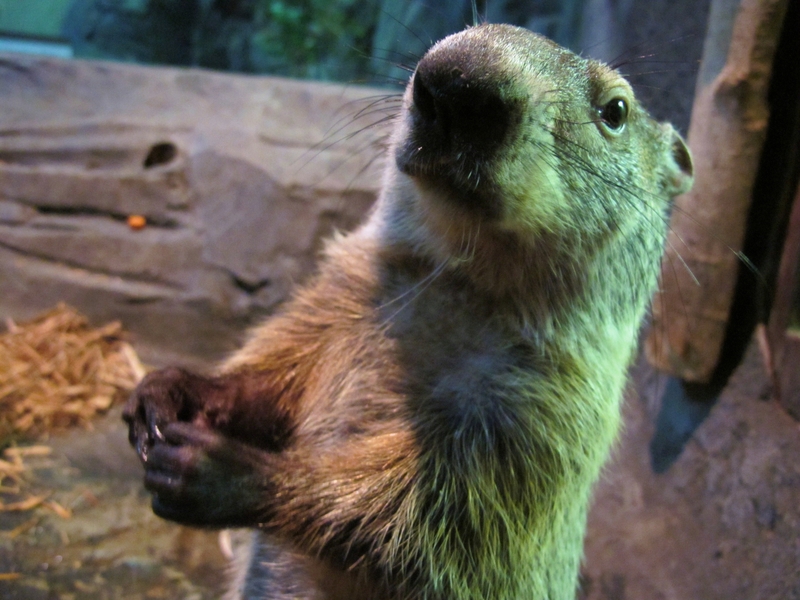 Phil wanted to mention that gophers were a different species entirely, but the words wouldn’t come out of his mouth. Tomorrow was the big day. He could feel the crowds stomping around the otherwise forgotten burg of Punxsutawney. The town depended on him, he knew that. He’d had the job since he was a pup, inherited it from his old man. Also named Phil. Who’d gotten it from his father, and so on, all the way back as far as he could remember. They had the gift, maybe it was merely a thin winter coat, as some grumblers said. But Phil knew he had it, that chill in his flanks that didn’t simply mean frost on the grass outside the den. It meant six more weeks of winter. His first two years, it hadn’t been there. He’d watched his old man waddle out, raise his gray-whiskered snout, and settle down to nibble the grass. People cheered, and sure enough, the crocus blossoms peeked from the snow, and winter was soon nothing but a forgotten harbinger of hibernation. The name was an honor. Every other guy was named Chuck, or Woody, and liked it. Same as they liked sweet alfalfa, and shagbark hickory nuts. Even the odd Charles, who put on airs, had never tasted treats from a top hat-wearing mayor’s hand. And they sure had never tugged a gym bag full of heirloom alfalfa sprouts down into their den, and watched their mate and pups stuff themselves silly on it. No, only a Phil could get in that kind of trouble. There was no returning it. The kids were cuddled up in the duffel, now chewed clean through. His mate watched him from atop the pile, her liquid dark eye blinking every few seconds, as he nibbled on dry shells to wear his teeth down. “Mating season’s not for another month,” he muttered into his paw. “Maybe that salad’s bringing my heat early,” she whispered, and wiggled her little wedge nose. He knew from experience they would come long before sun-up. The crowds arrived early, stamping their frostbitten toes, looking to get a good spot. The Mayor tapped his loafer in the grass, tossing a couple of roasted peanuts, in the shell, down the hole. One rolled in front of Phil’s nose. He’d wake to that rich shell, usually. This time, he’d been up all night. Thinking of his old man shaking his distinguished furry head, and begging his flanks to not feel so cold, so cold. “Ready for the show, kid?” The mayor said. The escape tunnel beckoned. Rank with the scent of their mating, its exit was clear across the field. He had a running chance. Maybe the man with no neck wouldn’t see him, wouldn’t squash him like a fat furry grape under the front tire of his Coupe DeVille. He could just be another Chuck, a Charles, even, and make a new life, in a new hole. They’d back the Caddy up to the den the same evening, feed the hose down, and let it do its work. The kids could escape, Phil thought. No. They’d fill in the exits, once they knew how he’d make his escape. His mate would die choking, curled up in the shreds of the gym bag with the gasping pups. Phil placed his paw outside his den. Acid in his belly, where tasty peanuts should have been. The crowded sighed, held a breath. All he had to do was nibble on the grass, ignore his instincts telling him to waddle back to the warmth of his hole. No, he wouldn’t drop pellets on his good family name. He’d take his lumps, when the men returned that night. Send his mate and the pups running. Phil turned his back on the crowd, and with one dramatic look over his plump shoulder, waddled back toward his den. The crowd issued a collective groan for the cameras. Phil knew he’d done the right thing. He felt courage swell in his heart. Then he felt the bullet burst his body apart, to the crowd’s shrieks and panic. LOL!!! !A mob hit on Phil, now that was awesome. Phil!! Dang… :-( Really enjoyed the subtle humor, though…! Hee "She was liable to panic, dig another burrow. Maybe eat the children." I, too, feel for Phil. I'd like to hope that maybe they rushed him to a vet quickly enough to save him, but "burst his body apart" sounds a bit final. You know, I've read this story a couple of times now and I think I like it better every time I read it…except for the fact that Phil buys it at the end…lol.But the way the voice came through and made a groundhog into "Phil" still astonishes me. All the subtle, little groundhog connections made this damn close to perfect also.Really enjoyed this. Except for Phil getting it at the end. Oh wait, I think I already said that. But that's how much you really made me like an f-ing groundhog! This was hilarious! Disturbing, and yet hilarious.